Or maybe I should just say kittens and puppies. It’s been raining cats and dogs at home, literally. 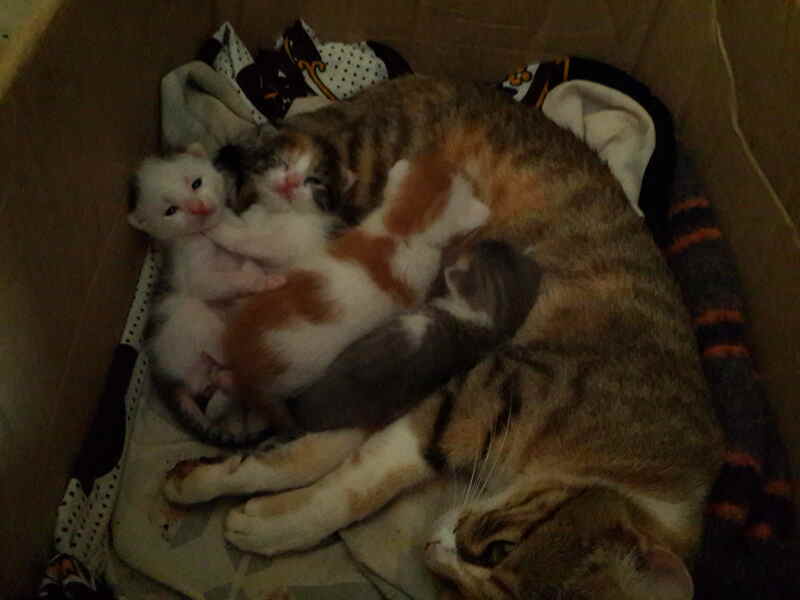 For starters, she finally delivered four lovely kittens! Yeah. That weekend I was in Kisii, she decided it was time. It was decided that I was not to be told because I left her. Lol. But my baby sis, Claire, wouldn’t let that happen. So she sneaked away and texted me on dad’s kabambe. Gotta love my fam. I was super excited that Saturday night. So I called Kim, my small big bro. He told me only one kitten was out by the time he found mother cat. Apparently she delivered on Mark’s bed (my small bro). Haha! That made me laugh. I was going to wait till morning to find out how many they were in total. You may wonder why I was so excited about the birth. Here’s the thing, animals in the Ngigi homestead have a fishy history. Especially cats. The cat we had before this one was straight up strange, I think because we did not feed her right. So she ate all the kittens she ever delivered. The first time, we saw signs but never saw the kittens. The second time, we found one kitten in the garage. After a few hours, my dad claimed he found her licking her paws from the meal. I was so disgusted. We all were. So the very next day, dad drove her to work and left her there. The cat before her was also disposed in an almost similar way because she would poo everywhere. The morning dad threw her out, she had poo on a sofa which found its way to dad’s laptop bag. LOL. I was asleep so I didn’t witness the drama. All I knew is that she had to go. This time round, I took it upon myself to really own this cat and feed it. I have been criticized unfairly by my folks for apparently treating her better than I should but hey, I couldn’t risk raising yet another cannibal! So every morning and every evening, she makes a racket if I don’t feed her. She is conditioned. She doesn’t poo anywhere. She only does it under the chimney we never use. You know how Kenyans have fireplaces for no reason? Haha. Yeah. So when her tummy enlarged, we were all very excited. She has like five suitors come over every night. Sometimes it would get very annoying. They make these strange noises when push comes to shove, like babies crying, you have to wake up and chase them away. Those efforts are what we’re now talking about today. Cats tend to have a very short gestation period. You may think that you still have a kitten at home, but she is a very fully-fledged mother. My cat is just a year old btw. By the next morning, she had delivered four beautiful things, although Claire insisted that they were ugly. Look at them, are they really ugly? 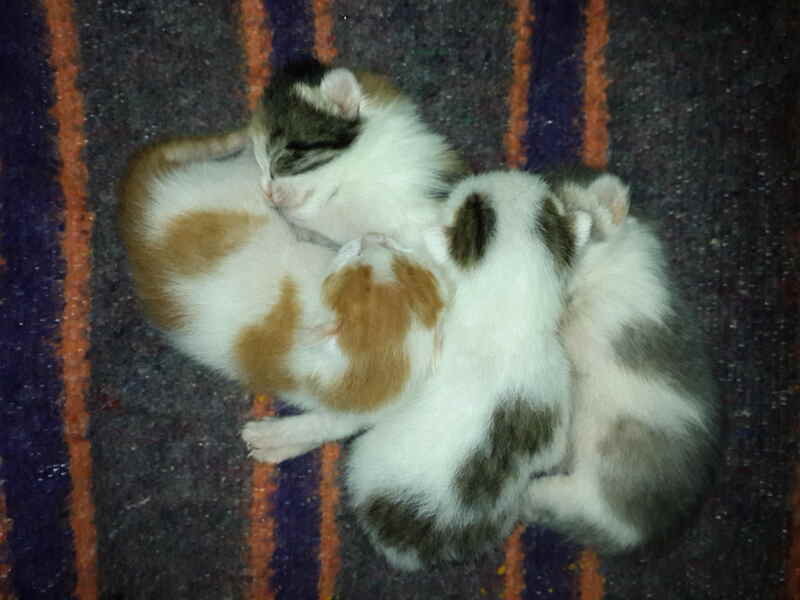 Mum moved them to a blanket on the floor and they stayed there for a while until she tucked them into a carton. Of course, without holding them. You know how it is when you touch kittens before they are ready. Apparently you make mum cat angry. So far, so good, I thought. No eaten kittens. Now came the part where we dusted the blanket at some point when mum cat was shenenekaing outside. Big mistake. She did not like it one bit. I woke up in the morning to find the kittens on sleeping Mark’s feet! I was so freaked out! It was a wonder he did not crush them in his sleep. I took them back into the carton and went to work. Forgot about them. First thing I checked when I came back home was the carton of course. Lo and behold, only two kittens were in there. I dropped my phone and freaked out again. She had finally began to gobble them up, I decided. I called out to people in the house but they were all out. Mum cat heard me and came mewing as usual, calling for food. Mark showed up and had an idea. He is always full of ideas this one. Throw her inside the carton and see what she does. Immediately she sniffed around and grabbed one by the neck and ran off with her, straight into my bedroom and under the drawers. So that’s where she was stuffing them! In my clothes. LOL. She came back for the other one, struggled to squeeze into the drawer. Failed. Came back. Dropped the kitten in the corridor and gave up. I had to place it in the drawer myself. All along I was thinking, OMG, ain’t you choking your kid! So we all began to blame mum as she was the one who came with the dust-the-blanket idea. Hehe. Anyway, eventually, mum said we would not let mum cat do what she wanted, so I had to add a new layer of cloth to the carton and place the kittens back while she was away. Suffice to say she has not moved since. She seems very content, no? Rewind to the dogs. 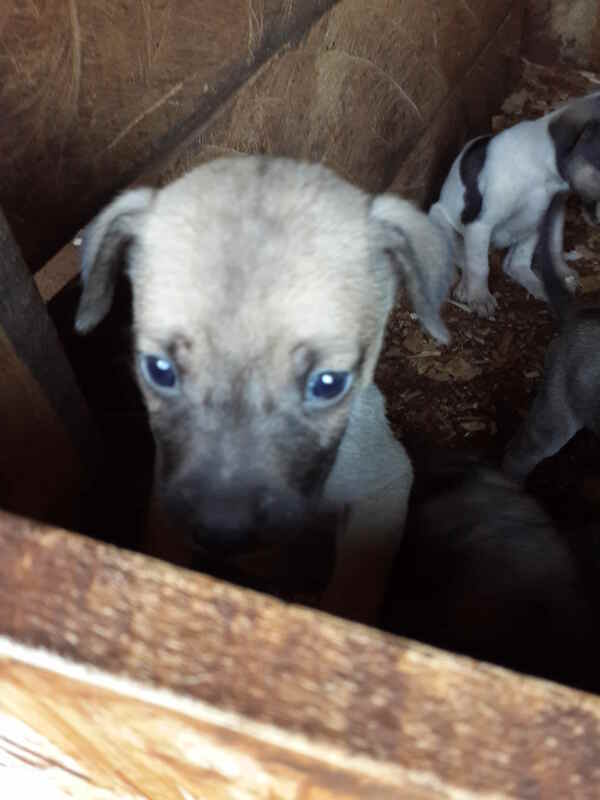 Our dog delivered seven puppies a few weeks ago too, back when I was having those regular headaches. We saw that pregnancy to term and were also dubious about it because the last time she was paged, they all passed on and looked weird. Mostly because she had been neutered. When I woke up today, I heard Kim making noise about how they were going to die because Mark left them out in the rain last night. Oops. Let’s hope not. The dogs are not vested to me and that’s why I am not as noisy about them as I am the cats. They are adorable all the same. I will invest in these ones too but only problem is that we tend to be at loggerheads about them a lot because everyone in this house has an opinion on how they should be handled. Also, we’re your typical African house where dogs are kept in a kennel that is not the cleanest thing in the world. But the men are trying of late, I’ll give them that, even with the rains. The rains that make them all muddy when they go on their hunting sprees and bring back dead stuff which they skin all over the compound. Finally, the girls have kittens, the guys have puppies, mum and dad have chicks. I should have mentioned that too. Chicks equals chicken equals eggs equals meat, whichever comes first. 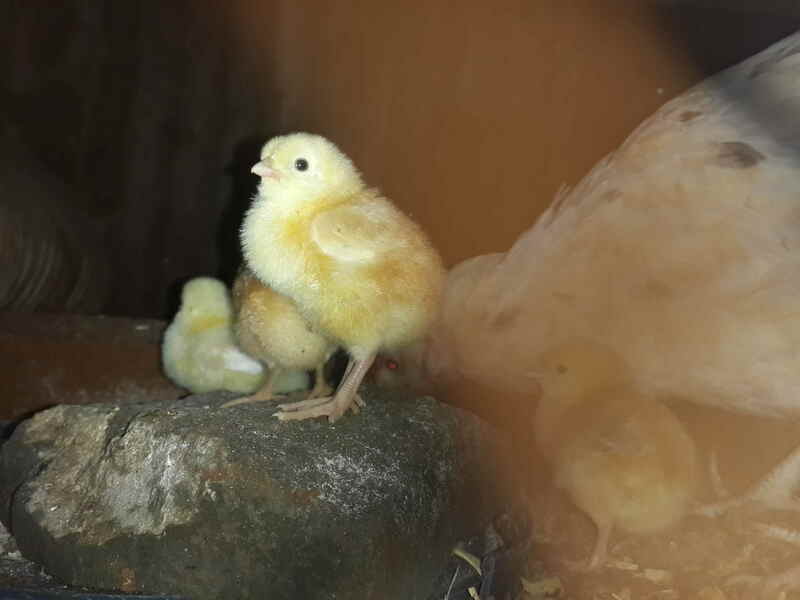 While we are fussing over animals that have no economic benefit to a Kikuyu home, folks are raising kienyeji chicken fast. Okay, maybe cats have a little benefit. According to folks, I have endangered that little (eating mice and rats) by getting her food. Dad has to use some pesticide on moles and rats all over the chicken house and shamba. All the same, we all find some joy in hanging out with an animal in the house. So in some way, it does have an economic benefit, indirectly. Or maybe I pushing my case too hard. Because sometimes, it’s just a pain to have a cat in the house. Since she and fam relocated to my bedroom, I wake up before my usual time to open the window for her to get out and do its business. She walks up to your face and is all up in it until you wake up. Then she walks back in from the rain with muddy paws through the bathroom window and the whole place is a mess. Did I mention that taking the poo out of the fireplace is a nose-wrinkling affair that takes a million kinds of buffers to prevent any kind of contact with the skin? Having said that, njahi ni kwa wingi. Who wants some kittens? And now I want kittens again. Should I give in?